elcome to “The Adventures of Alice in Referendumland,” a spoof on the farce being made of the law in Canada to dismantle the country for North American Union. The reader may recall that Alice’s Adventures in Wonderland begin with a voyage down a rabbit hole. It is no small coincidence that her Canadian adventures begin down a Constitutional hole. “Alice” therefore will be of most interest to Constitutional lawyers, and hopefully to law students, who can have fun puzzling out the symbolism. However, the whimsicality and air of humour may appeal to anyone. Suspend your disbelief, and voyage with Alice in Referendumland, where you will meet Queen Amphibia: the Great Ancestress of all Golf Green Queens, Old Walrus Lucien Bouchard, the Black Queen, the Green Queen, Inter-Golfer Affairs Minister Stéphane Dion, the Law Professor, the Supreme Fish, and that Old Sheep, Pahh-Pahh-Pahrizeau of the London School of Golfenomics, among many unforgettable others. The Episodes will appear — not necessarily in order — as they are written and updated. eferendumland is a virtual reality created in the mind of the observer who is completely unaware of the unreality and who behaves as though everything were real. His actions, however, in this drugged state, affect the real world. And thus, the whole point of the illusion: to make the victim act in the real world, while believing he is doing something else. Referendumland is the product of inherent characteristics of the observer: largely, ego. However, the illusionary world is dependent upon and shaped by external influences, chiefly mass media applied to general ignorance and the willingness to be deceived. As in hypnosis, incessant repetition is required to maintain the dupe fast asleep. Thus, the background noise in Referendumland is the sound of snoring. Let us remember, then, in the first place, that political institutions (however the proposition may be at times ignored) are the work of men—owe their origin and their whole existence to human will. Men did not wake on a summer morning and find them sprung up. Neither do they resemble trees, which, once planted, “are aye growing” while men “are sleeping.” In every stage of their existence they are made what they are by human voluntary agency. Like the unconscious field, infinite in expanse, Referendumland extends every way in the distance, easily obscuring the sign posts of truth, suppressing all risk of doubt in the drugged stupor of a mind sunk in illusion. In Canada, men “are sleeping”. Referendumland is psychological warfare by the elites against their willing dupes. 2 Albert Venn Dicey, Introduction to the Study of the Law of the Constitution (LF ed.) ; quoting John Stuart Mill on Representative Government, p. 4. 3 Reference re Secession of Quebec,  2 S.C.R. 217, para. 52.
irtual reality is based on warped reality. So, for the most part, the characters in Referendumland are warped. They are real people who deliberately convey a warped reality to achieve their aim of deception. Only two characters are not warped: Alice and her adviser, Constitutional Cat. They are not warped because the Cat knows the difference between truth and fiction. And, Alice is not warped — for, she alone, can see the Cat, and she alone contests the close-up deception behind the apparently wonderful but misleading view in Referendumland. male Chief Magistrate was needed for Referendumland. He sits throned beside The Green Queen, presiding at the Trial of the Tarts. Several real-life men were available on whom to base the character. The one chosen, François Rolland, comes from the law firm, Fasken Martineau, which has defended the Communist referendums to “secede” in Quebec as co-counsel1 with the Quebec Justice Department. Rolland has also done the pro-Soviets a little favor. As an ordinary judge of the section 96 court, the Quebec Superior Court, he initiated the practise of judicially declaring litigants mad.2 This may have won him his promotion to Chief Justice of Quebec Superior Court. Rolland therefore deserves the honor of the role of Chief Magistrate in Referendumland. “Order! Order, I say! Order in the court! 1 “Fasken Martineau” was known at the time as Martineau Walker, co-counsel together with Saint-Laurent Boucher Gagnon for the Attorney General of Quebec (Paul Bégin) in the file known as “Bertrand No. 1” with the following citations: Bertrand c. Québec (Procureur général), filed 11 August 1995 (S.C. 200 05-002117-955) (1995), 127 D.L.R. (4th) 408, (sub nom. Bertrand c. Bégin)  R.J.Q. 2500, 1995 CarswellQue 131 (Que. S.c (4th) 408, (sub nom. Bertrand c. Bégin)  R.J.Q. 2500, 1995 CarswellQue 131 (Que. S.C.). Also see: Roopnarine Singh et al. v. Attorney General of Quebec, filed 23 October 1995 (S.C. 500 05 011275 593). By the time Martineau Walker has become Fasken Martineau, they sit again as co-counsel for the Quebec Attorney General in: Henderson et al v. AG Quebec, filed 10 May 2001 (S.C. 500 05-065031-013) Quebec (Procureur general) c Henderson, 220 D.L.R. (4th) 691,  R.J.Q. 2435, 2002 CarswellQue 1711, J.E. 2002-1672, REJB 2002-33374 (C.S. Que. Aug 16, 2002). 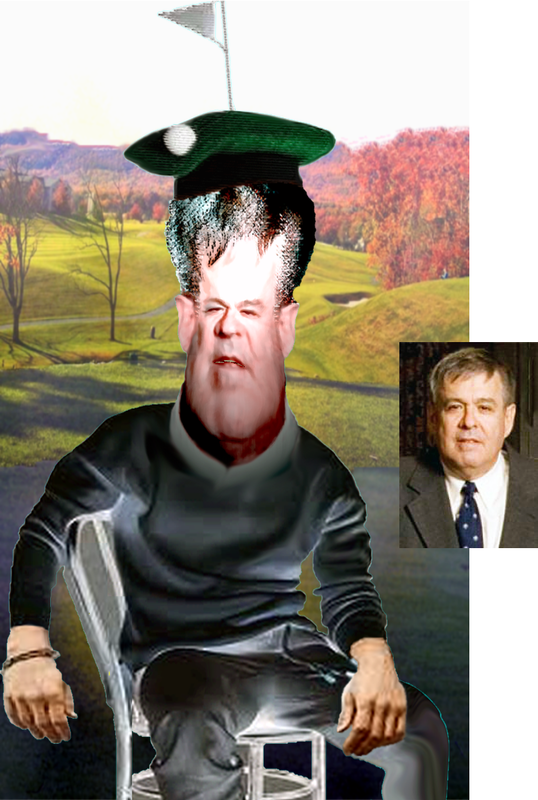 tephen Allan Scott is The Law Professor and Golf Pro in Referendumland. In real life, Scott usually keeps his head down, which is great for a golf swing, but also keeps him out of the limelight while his client and sub-counsel face the media. Scott had his iron in for the 1982 phony “patriation”,1 including free golf tips to the Kershaw Committee in England, under Lord Anthony Kershaw, who deceived United Kingdom Parliament into passing a coup d’état as a “new” constitution for Canada. Scott has had a swing at all major subsequent attempts to “warp” what is left of the Constitution of Canada (after the 1982 coup d’état) to purchase international state recognition for Quebec after a “Yes” in a final referendum. To that end, Scott has taken a shot at the Meech Lake and Charlottetown Accords, and continues to play a major role in warping reality, above all “legal” reality. In 1994, the year before the 1995 Quebec referendum, Law Professor, Stephen Allan Scott, tactically founded the Special Committee on Canadian Unity. Scott’s deceptively named Special Committee on Canadian “Unity” is really a Special Committee on the Mode of Dismantling Canada. Scott and his band of Charter warriors are trying to enforce “negotiation” to dismantle all of Canada rather than let Quebec float off alone into the Atlantic. There is no opposition to the break-up of Canada, as the Special Committee name implies. The Law Professor and The Politician in Referendumland, like the armed belligerents in Lilliput, are fighting over which way to crack an egg. In this case, over which way to break up Canada. 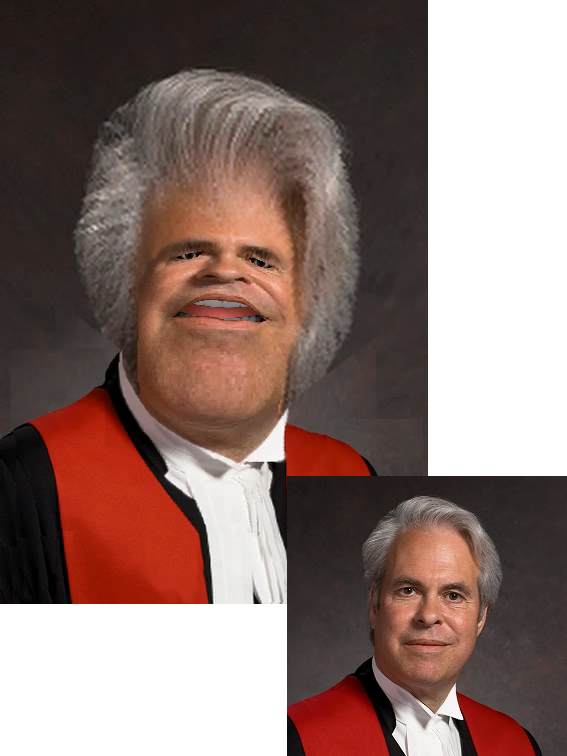 Scott is lead counsel in the current “emergency proceeding” at Quebec Superior Court (pending for nearly twenty years while prosecuted in fits and starts).1 Most of the original litigants now being senile or dead, Politician Keith Henderson intrepidly pursues his “Bill 99” “case” alone. 1 See, online, “Patriation and Legitimacy of the Canadian Constitution” by Barry Lee Strayer (1982). 2 “Law Professor Scott” has been lead counsel in the controlled opposition against a Quebec UDI. He first emerges, for the plaintiffs, in Roopnarine Singh et al. v. Attorney General of Quebec, filed 23 October 1995 (S.C. 500 05 011275 593). 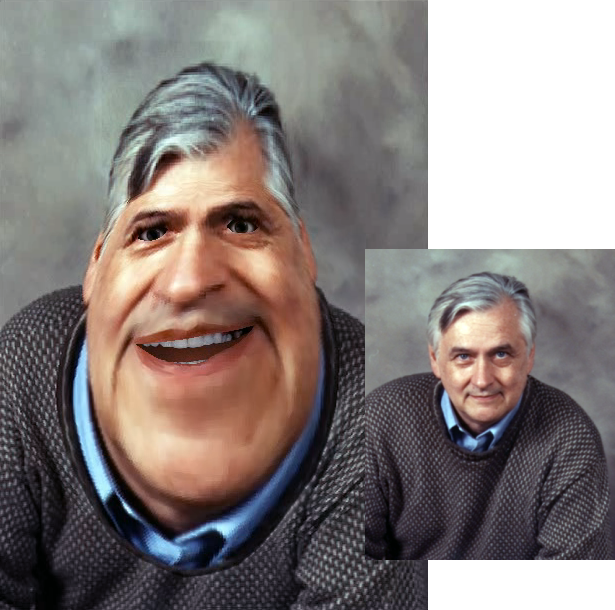 He is currently up first in the mutating file of Henderson et al v. AG Quebec, filed 10 May 2001 (S.C. 500 05-065031-013); Quebec (Procureur general) c Henderson, 220 D.L.R. (4th) 691,  R.J.Q. 2435, 2002 CarswellQue 1711, J.E. 2002-1672, REJB 2002-33374 (C.S. Que. Aug 16, 2002); Henderson c. Québec (Procureur général), 2007 QCCA 1138 (CanLII), 500-09-012698-023 ( RJQ 2174); Henderson c. Procureure générale du Québec, 2018 QCCS 1586 (CanLII). he star client of The Law Professor and Golf Pro in Referendumland is litigant, Keith Henderson. Keith Henderson is The Politician in Referendumland. Henderson quietly observed the Quebec Legislature passing a coup d’état in the form of a statute, with an ‘in force and effect’ date of February 28, 2001. Henderson did nothing about it, despite the well known effects of “presumption of constitutionality” and abundant precedents for judicial interception of similar events to avert catastrophe. In this case, the failure to avert has caused Time to stop in Referendumland. “But, we have been misled over these decades … by — and it’s ironic [finger-pointing and proudly sneering] because … these old ideas about, you know, protect yourself, from “la langue francaise” and “on doit se protéger” — those are European ideas from fifty to a hundred years ago. Those are old, nationalist things, and so many Europeans left Europe to get away from that. To come here, because they thought it was free and open and they could teach their kids, you know, Italian and English, and French. 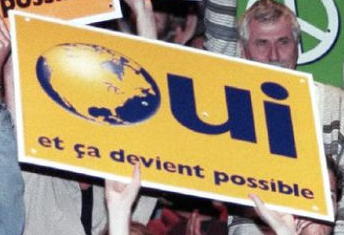 [caption id="attachment_423" align="alignleft" width="220"] The 1995 Quebec referendum on North American Union. Translation: “Yes and it becomes possible”. Not Quebec “sovereignty” but the end of the nation-state, including the end of a new and only temporary Quebec nation-state required to lead the “negotiations” to destroy it all. Do you think the question was “clear”? Do you think the Americans might have liked a vote? [/caption] Henderson is a globalist. He means openness (“ouverture”) as in Open Borders, which is really what Scott and Henderson are pursuing for Canada: complete dissolution by forcing all the provinces to “negotiate” decentralizing Canada into international city-state regions in a borderless North America after a “Yes” in Quebec. If you hadn’t noticed one of the official logos of the 1995 referendum, it was a map of the North American Union; still underway despite the allegations NAFTA has ended. Also notice that Trudeau colleague, René Lévesque, in his referendum in 1980, was trying to dismantle Canada to convert it to the European Community system. We thus have, in Politician Keith Henderson, not an opponent of the dismantling of Canada, not an advocate of Canadian “unity” (which is compulsory under the Constitution and not an option) but controlled opposition. His “Bill 99” file at Quebec Superior Court is a part of it: an integrated part of the overthrow of Canada.